A European dark honey bee (Apis melllifera mellifera) pays a springtime visit to the bloom of a chicasaw plum (Prunus angustifolia) near SRS’s L Lake. 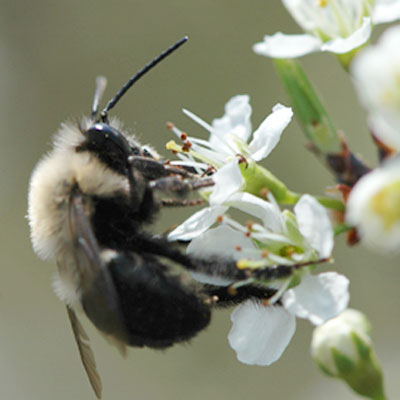 The bee, sometimes referred to as a German black bee, originally occurred from Britain to Central Europe; it was introduced to North America in colonial times. Chicasaw plum normally is quite shrubby—a head-high thicket of branches all pointing upward—and can be found in the powerline cut near the top of L Lake and in other “open” habitats, including agricultural fields that have been out of production for several years. The species, a member of the Rosaceae (or rose) family, provides excellent food for wildlife, as its drupes mature, fall to the ground, and are eaten by birds, small mammals, and deer. The fruit also is edible to humans—most frequently in sauces, pies, preserves, jams, and jellies. The 2009 SRS Environmental Report cover photograph was taken by Al Mamatey of Savannah River Nuclear Solutions’ Regulatory Integration & Environmental Services Department. The report's interactive CD and associated web pages were created by Marvin Stewart of SRNS's Information Technology Department. The cover and CD label were designed by Eleanor Justice of the company’s Records and Document Control Information Section – Information Management and Program Support Group.